The second Galileo In-Orbit Validation Element satellite, GIOVE-B, was launched from the Baikonour cosmodrome in Kazakhstan on April 27, 2008. Its main mission objectives are to maintain frequency filing, provide in‑orbit validation of the Galileo payload units, specifically the passive hydrogen maser (PHM) and solid‑state power amplifiers (SSPAs) that were not flown on GIOVE‑A, measure the middle earth orbit (MEO) radiation environment, and continue signal-in-space (SIS) experimentation. GIOVE‑B’s signals in space are fully representative of the operational Galileo system in terms of radio frequency and modulations, as well as chip rates and data rates. Before the launch, GIOVE‑B’s signal generator was upgraded to accommodate the MBOC (multiplexed binary offset carrier) modulation on the L1 signal. In fact, the first signal successfully transmitted by GIOVE‑B was the composite BOC (CBOC) version of the MBOC signal. However, the navigation message currently being transmitted is not representative of the fully operational version from the perspective of structure and contents and is used for demonstration purposes only. In addition to the main in‑orbit test (IOT) station in Redu, Belgium, the European Space Agency (ESA) commissioned the Science and Technology Facilities Council (STFC) Chilbolton IOT station in the United Kingdom — which has been used for GIOVE-A commissioning and experimentation — to provide complementary measurements for GIOVE-B as well. This article will present key results from the IOT campaign for GIOVE-B, primarily based on observations made at the Chilbolton station during May and June of this year.
. . . As with the first Galileo spacecraft, GIOVE-B first underwent platform commissioning activities. Following successful commissioning of the platform, the nominal payload units were switched on for the first time on May 5, with the first navigation signals transmitted early on May 7.
. . . For users, probably the most relevant parameter of interest is the signal power they receive on the ground. This can be evaluated from the EIRP by subtracting the free space path loss (FSPL) experienced by the signals as they travel from the satellite to the user.
. . . Off-Line analyses were performed on digitally sampled segments of the GIOVE‑B navigation signal-in-space received by Chilbolton Station’s high-gain antenna and compared with the “ideal” waveform of such signals.
. . . Four repeat IOT campaigns are planned throughout the lifetime of the GIOVE‑B mission. The aim of the campaigns is to assess the performance of the payload throughout the lifetime of the mission in order to verify that no degradation has occurred in the navigation signals. The GIOVE‑B satellite has now joined GIOVE‑A in routine operations. 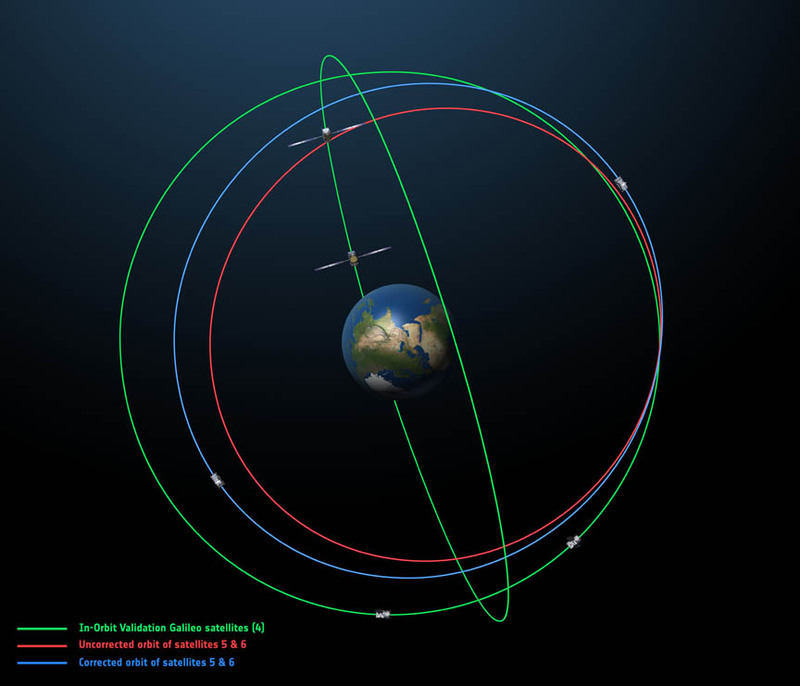 With the exception of specific future IOT activities or spacecraft maintenance, both satellites are now continuously broadcasting prototype Galileo navigation signals that can be used for SIS experimentation purposes. We recognize the outstanding cooperation with the spacecraft prime: EADS Astrium GmbH (Ottobrunn, Germany); payload prime, EADS Astrium UK (Portsmouth, England); and the ground control station, Telespazio (Fucino, Italy). The authors also acknowledge the excellent ongoing work performed by SSTL, STFC, and ESA project teams in supporting the Chilbolton in-orbit test campaign on GIOVE-B.